Triggit, the so-called “demand-side platform” that buys ads in real-time bidding exchanges for about 200 clients, won $7.4 million in series B funding from Spark Capital and Foundry Group, the company said. The new investment came after explosive growth in the business Triggit is placing inside FBX, Facebook’s RTB ad exchange. FBX works by allowing outside advertisers to drop tracking “cookies” on users’ web browsers. When those users sign into Facebook, the cookies triggers ads promoting those advertisers. Triggit’s clients include Hilton, Kmart and Lowes. CEO Zach Coelius told us his company handled about 200 clients internationally, all of which spend upwards of about $10,000 a month on RTB ads. The company has grown from about a dozen staff at the beginning of the year to 32 employees today. Here’s an interesting chart from Bespoke Investment Group that Jeff Saut included in his weekly market commentary. It marks the average election performance of the S&P 500 and compares it to the index this year. “[T]he Presidential trading pattern identified by our friends at the brainy Bespoke organization indicates stocks should firm from here,” writes Saut. It’s been hard to gauge how big Facebook’s new real-time bidding platform for advertisers, Facebook Exchange, has become since it was launched in June, but global sales chief Carolyn Everson let slip just how big it could be in a recent conversation with Adweek and Group M digital chief Rob Norman. We love it. We absolutely love it. Massive, massive, massive increase in the amount of exchange traded media. We think it’s probably quadrupled the market in terms of availability of total impressions. So we are very excited about Facebook Exchange. We’re excited about the results that we’ve seen. Our performance so far in the Exchange is doing better than the Google Exchange, and Triggit and others have all spoken up on our behalf. Nonetheless, it’s yet another breadcrumb on the trail toward Facebook’s claim that it is on the way to gathering a new $2 billion ad marketplace. The pattern is ominous: Revenue growth at Interpublic Group just went negative for the first time since the last recession. All the other companies are trending down. GDP growth is anemic — and that number isn’t the government’s final estimate. The final number may be worse. 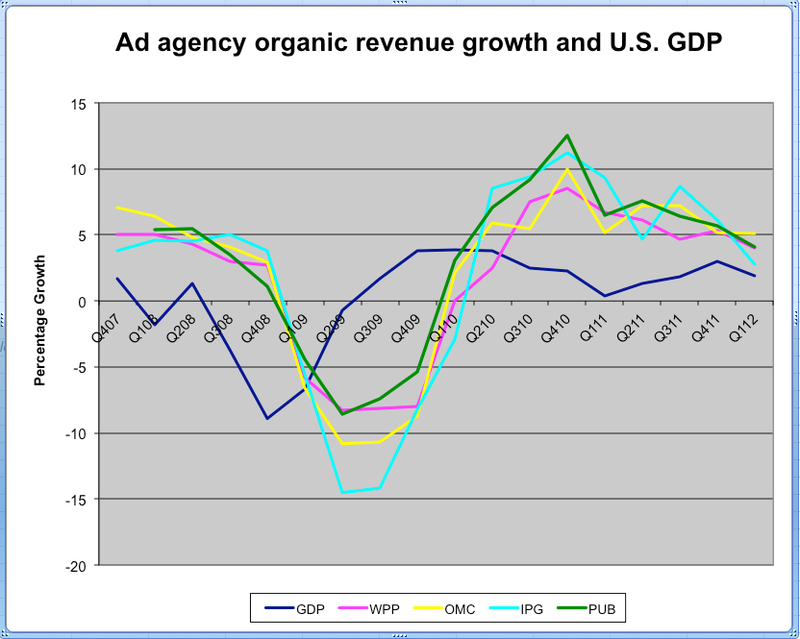 This chart plots “organic” (like for like, year-on-year) revenue growth at the four largest ad agency holding companies and compares it to sequential growth in U.S. GDP. Those companies are WPP Group (which owns Ogilvy, Y&R and JWT, among others), Omnicom (BBDO, DDB and TBWA), Interpublic Group (DraftFCB, McCann and Deutsch) and Publicis Groupe (Saatchi & Saatchi, Leo Burnett and Digitas). 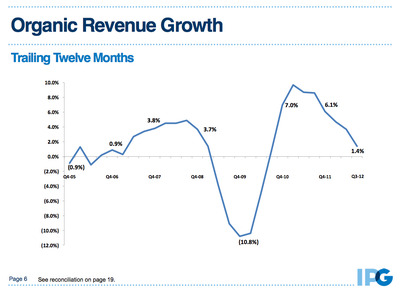 We believe it is interesting because advertising revenues are a good proxy for economic growth globally. They represent a broad range of companies with revenues that come from both the U.S. and foreign countries, and companies signal their optimism via their willingness to spend on ads. The obvious caveat: The sequential vs. y-o-y numbers are apples vs. oranges. So is this anecdotal trend real, or a mi! rage? Le t’s examine the evidence. 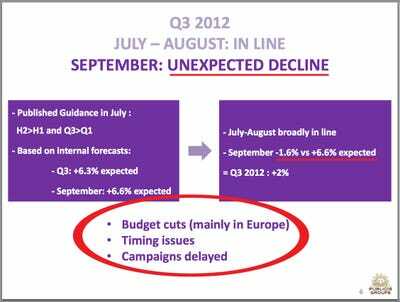 This is Interpublic’s ‘Powerpoint From Hell.’ We’re basically right back at 2008, according to IPG’s numbers. It doesn’t matter where you look at IPG, everything is trending negative. Everyone remembers when Facebook bought Instagram for a headline-friendly billion dollars last April. But what about the 10 companies it acquired after that? Or the 29 prior? The social media landscape is in such a constant state of flux that it’s sometimes hard to remember who did what when. The Interactive Advertising Bureau (IAB) and The Jordan, Edmiston Group Inc (JEGI) teamed up to take snapshots of what the social media ecosystem looks like right now. Among other things, its report also breaks down the acquisition timelines for major digital players, including Facebook, Twitter, LinkedIn, Salesforce, and Google. Furthermore, Facebook is known to scoop up its competition for hefty chunks of change. 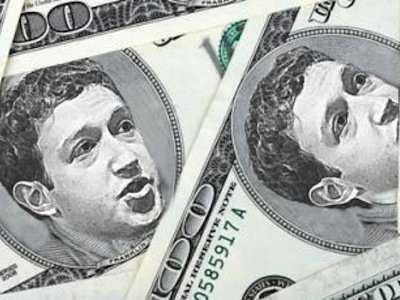 When threatened by Instagram in the image and mobile space, Facebook bought the start-up for a cool billion dollars. Twitter’s acquisitions help boost user experience and its ad-based business model. The report notes that “areas of interest include keyword bidding, social marketing automation, geo‐targeted ads, and social analytics,” which is reflected by recent buys. Ever wonder how much data you burn through every month on average? If you’re an Android user within the US, odds are that it’s quite a lot. The NPD Group estimates that Americans of the Google persuasion typically consume about 870MB of data on cellular networks every month. While it’s not an extreme amount next to the 2.5GB of WiFi usage, it’s enough to give anyone second thoughts about coasting on a basic data plan — and a reflection of how both 4G and media apps have changed our behavior. Not surprisingly, it’s a younger crowd more comfortable with smartphones that’s the most aggressive: the 18-24 set races through 1.05GB a month where the 55-plus audience uses a more modest (if still healthy) 750MB. We don’t yet know how iOS stacks up in current conditions, but the NPD is promising a comparable look soon. Something tells us the iPhone 5’s LTE will lead to just as much voraciousness. NPD: Android users chew an average 870MB of cellular data per month, youngest gobble the most originally appeared on Engadget on Fri, 28 Sep 2012 13:12:00 EDT. Please see our terms for use of feeds. 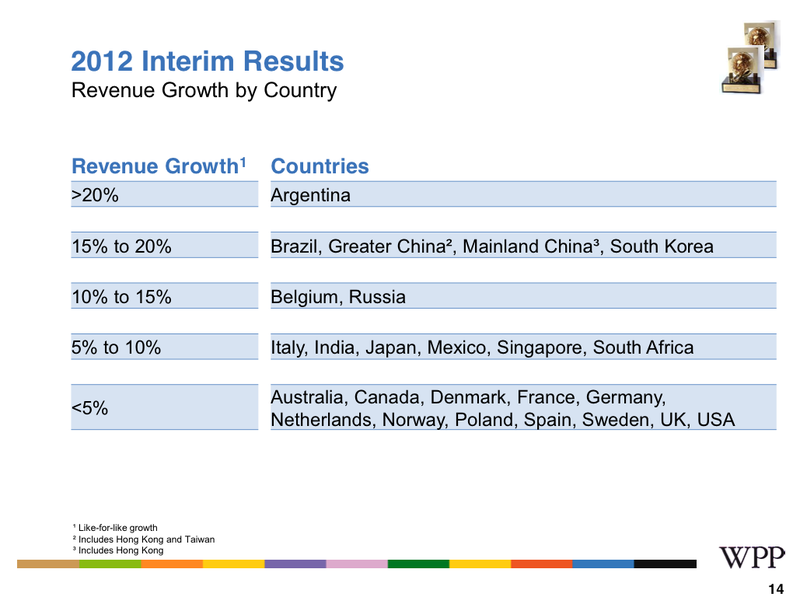 WPP Group, the world’s largest ad agency holding company, reported its Q2 2012 results and the revenue breakdown shows a complete reversal of fortunes for North America: When previously growth was strong in the U.S. and Canada, now it is contracting; and where growth in Europe was anemic, now it is robust. The key metric is “LFL,” or like-for-like” revenues. Note that North America declined 0.6% in Q2 while Europe grew between 0.8% – 3.5%. 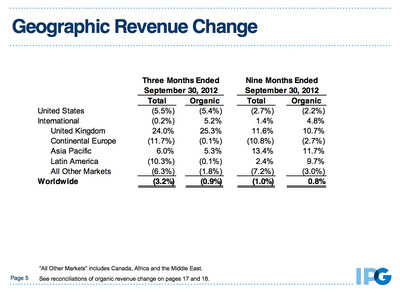 Ad agency revenues hinted at the retraction back in Q1, also. Ad agency revenues are—arguably—a good proxy for economic growth as a whole because they come from a wide variety of consumer-facing companies who often adjust their spending as a percentage of total sales. 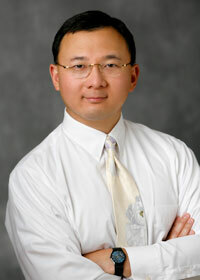 Please follow Advertising on http://t witter.com/BI_Advertising”>Twitter and Facebook. 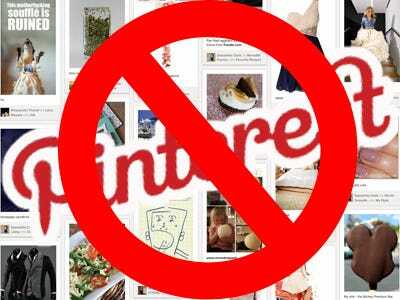 According to The Creative Group’s survey of 500 U.S. advertising and marketing execs, only an incredibly small percent of agencies are on Pinterest. According to the survey, a staggering 18 percent of marketers have never even heard of Pinterest. Considering the social media site’s meteoric rise, you’d have to assume their shops are based out of remote, Wi-Fi-free caves. Consumers, on the other hand, are loving the social media darling, which grew from from approximately 1 million to 20 million users between July 2011 and July 2012. Kantar Media Company’s Compete conducted an online shopper intelligence survey suggesting that one in four consumers spend less time on other social media sites like Facebook and Twitter in favor of Pinterest, and 15 percent claim that they don’t use any social media sites except for Pinterest. Considering that the sharing site is photo-based, brands have produced some visually compelling work on Pinterest. (Uniqlo found a really cool way to create a scroll animation on the site). Agencies, what do you think? Do the stats seem right? Why do or don’t you use Pinterest? Explain in comments or email LStampler@businessinsider.com. Knight Capital’s clients have completely flown the coop after a software error in the company’s trading software caused the company to stomach $440 million in losses, according to three different traders consulted by Business Insider. Wall Street institutions large and small no longer feel comfortable using the market making firm to execute their trades in the wake of the snafu, essentially cutting of its business. An equities trader explained that Knight was the “last place” he would go to execute a trade. 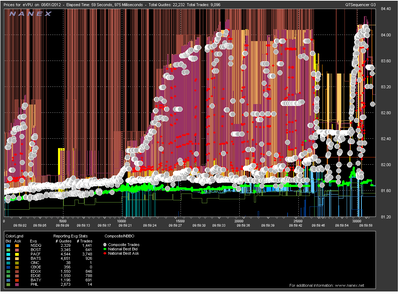 Others expressed befuddlement and the firm’s inability to rectify the trading error for a full 45 minutes. Wall Streeters’ abandonment of the firm bodes ill for the company’s ability to recoup losses. In May, the company had a daily trading volume of about $21 billion. Shares of Knight Capital Group fell 63 percent during trading yesterday, and many predict the firm will go under without outside aid.